This In My Kitchen post can't really compete with the August edition, but by focusing entirely on baby news last month, I do have two months of food-related kitchen items to share now. An advance warning: there are lots of bought items! Before I started maternity leave I made a visit to Ms Cupcake in South London, taking advantage of its relative proximity to my workplace and figuring I wouldn't manage to visit again during the year I am off work. Ms Cupcake is a fully vegan bakery specialising in cupcakes, and I bought carrot cake and peanut butter-chocolate varieties of those. However, the store also stocks lots of vegan products and I snapped up a vegan wagon wheel and some peanut butter cups. Both were excellent. Once I did start maternity leave I found the adjustment out of work a little challenging and some of the pre-baby days rather long. (Although, I do now have moments of wishing I appreciated those lazy, uninterrupted, empty days!) They did give me a chance to wander supermarkets I don't usually get to, with more time than I usually have for food-related browsing. Whilst we have an Asda near us it is horribly busy on Saturdays and so we rarely visit - going mid-week was a less chaotic experience and allowed me to discover Asda Free From millionaire's shortcake squares and caramel rice squares. 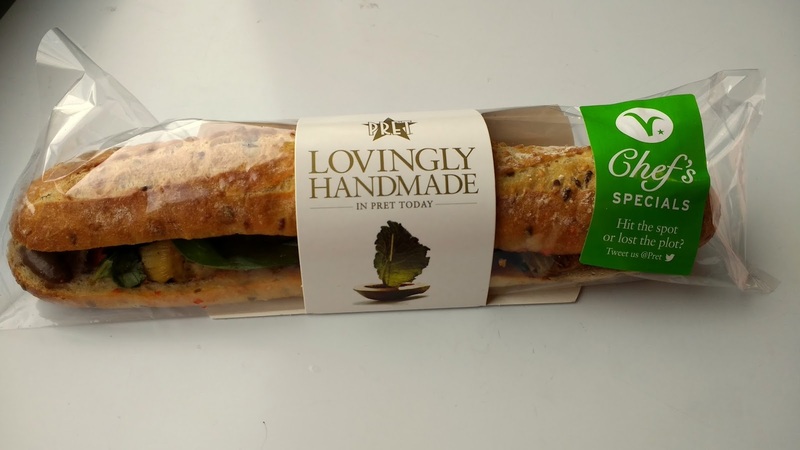 They are effectively an Asda take on the Lazy Days brand squares / slices, and good for a less pricey option, although I think I prefer the Lazy Days ones. I also explored an M&S food hall thoroughly and tried their soya yoghurt pots layered with fruit. They were good, although not really worth going out of one's way for. 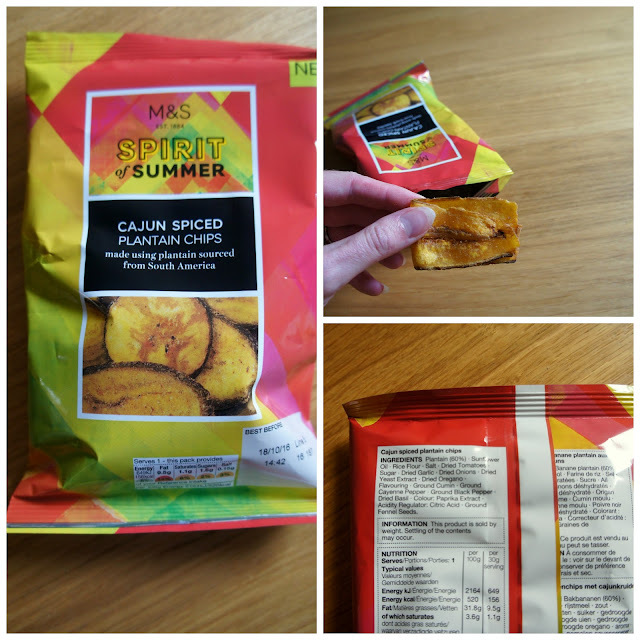 I did enjoy their Spirit of Summer cajun spiced plantain chips, and then dark chocolate featuring pieces of the same chips. The chips were quite spicy and best had in small doses, but worked brilliantly in chocolate form. I was interested to see the new carrot cake flavoured Nakd bars recently and bought a pack with high hopes. Alas, I didn't like them as much as my homemade carrot balls or other Nakd bar flavours. There is a new peanut flavour available too (and possibly others I haven't seen) so I will venture to try that in due course. 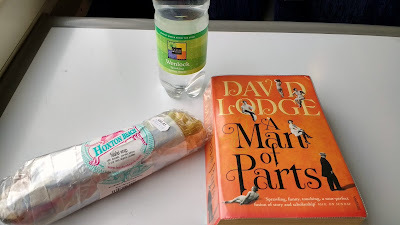 In addition to wandering supermarkets, I used pre-baby maternity leave for some leisurely trips into central London. I had bought an annual train pass for work commutimg that helpfully expired 2 weeks after Mini Bite was born, and so justified my visits with the notion of getting maximum value from the pass. By my reasoning, this also gave me an excuse to buy lunch once in the centre! I was delighted to see Pret a Manger brought back their artichoke and red pepper baguettes for a while and ate several while they were on offer (sadly they are a rotating special and no longer in store). I also tried a Hoxton Beach falafel wrap, which was delicious with a generous quantity of falafel and plenty of flavouring. Despite what the above suggests, I have eaten more than store bought products and treats. A vegetable highlight was aubergine and peppers roasted with sriracha, paprika and maple syrup. Indeed, I ate an entire aubergine and pepper for lunch in this format. 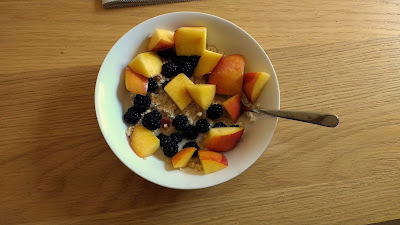 ...including blackberries picked from local wild bushes. With breastfeeding I have had a voracious appetite at times and I've been impressed at how my cravings lean towards fruits, vegetables and whole grains (well, alright, sometimes - at other times I crave peanut butter and chocolate!). 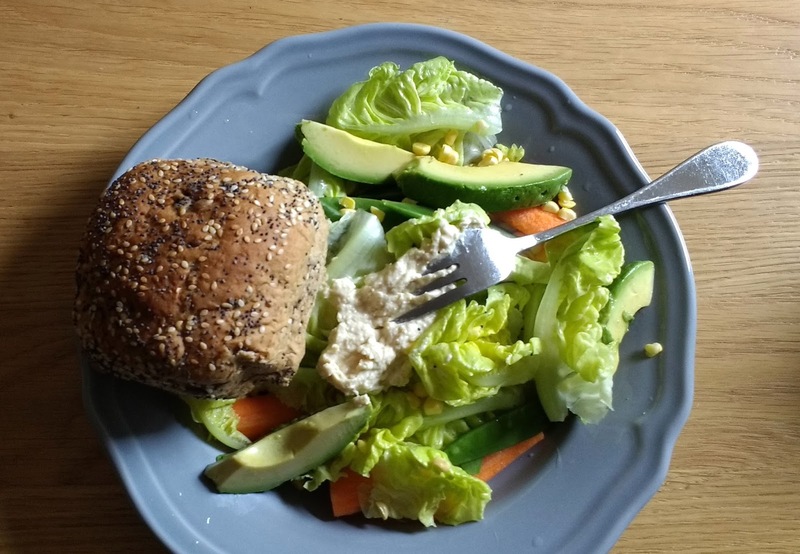 The salad below is an example of the healthier cravings in action. Maureen of The Orgasmic Chef has been taking a break from hosting In My Kitchen, due to health issues, and I wish her well for returning this month or whenever her circumstances permit. You'd make a great swap box partner with all those goodies! The Asda Free From products look pretty nice. I'm jealous of your fresh picked blackberries! I take such joy in the berries! Those plantain chips, but I haven't seen them in the UK before, so I need to buy some of these. Thanks Johanna... definitely not enough sleep but I hope we'll get there! I loved seeing all of these treats in your kitchen. What fun! Ooooh I want to go to the cupcake shop! Did you like the Cleo's cups? I've seen them but haven't tried them yet. They look good. Thanks for the heads up on the Nakd bars - it's something I would have liked to try, but only if it was really good. I loved the Cleo cups - definitely recommend them! If there is ever an excuse to eat all the things, breastfeeding is it! All of those things look delicious and I love that you were able to take advantage pre mini Bite to get out and explore a bit. That baguette does sound amazing! I wish I could have it regularly!